There are three elements to a successful speech. It should be understood. It should be memorable. And it should engage the audience for as long as possible. But being memorable doesn’t mean singing, dancing, and fireworks. Being memorable means people can talk about your speech a week later and at least vaguely recall what it was about. 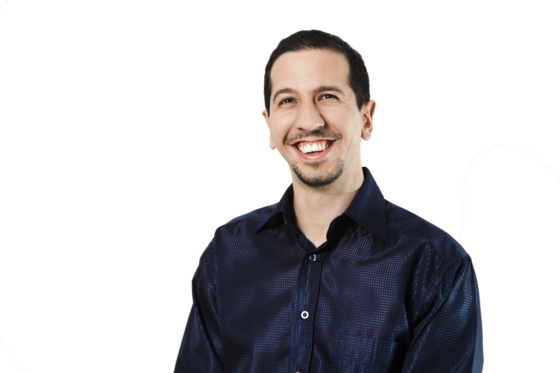 These three elements are so tightly bound that you will find many of the memorable speech tips outlined here also translate to help you engage people and allow them to understand your speech. You have an emotional connection to your speech, and ergo you cannot see its flaws. Perform it in front of your friends and family, and they may like it because they have an emotional connection with you. If you’re lucky, they may tell you if your speech is boring. But they may not be brave enough to hurt your feelings. Should you put your speech on YouTube and see what the commenters say? That would be the same as oil painting a picture of a banana and showing it to a bunch of monkeys. What you need to do is become more objective—which is easier said than done. You can do this by creating a personal negative bias about your work. With your negative bias, first automatically assume that your audience is bored in the same way you should assume your website is boring. Go through each line and paragraph, and ask how a bored person may change it. That might mean shortening your speech, or it might be getting to your point more swiftly. And in many cases you can add a joke, an anecdote, or a question to recapture the attention of your audience. Create a negative bias that assumes your audience is already bored. 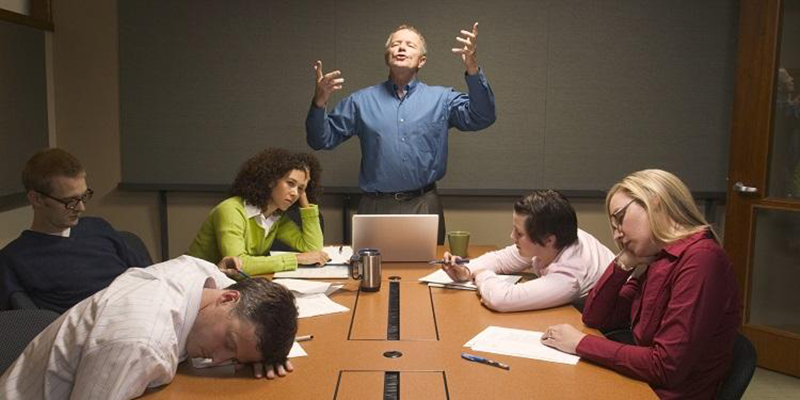 Examine each element of your speech, and ask how you can make it less boring. Let me repeat: a memorable speech doesn’t mean an epic speech. Unless you are about to lead the charge with the Riders of Rohan, you do not need a rousing speech leaving people crying and throwing their cowboy hats in the air. It is unlikely the topic of your speech is going to be meaningful enough to the listener to evoke more than the mild feeling of warmth, so stop trying so hard to create a big epic speech. Your goal is to make your speech memorable, and don’t worry, it doesn’t require a raised voice. Watch a Lewis Black stand up show. Here is a guy known for shouting and being angry. But despite his reputation, he doesn’t actually shout or raise his voice that much. He has done so well because of the cadence in his voice, the way he projects himself, his inflections, his physical actions, the way he carries himself, and the content of his stand up speeches. Sure, he has his angry and shouting outbursts, but they are to highlight the point of his jokes, not to make his stand up routine more memorable nor to make people jump up and down on their seats. Try to do a big rousing speech like Mel Gibson in Braveheart, and you will make a fool of yourself. Just watch any speeches during college presidential elections, and you will see fools-a-plenty. 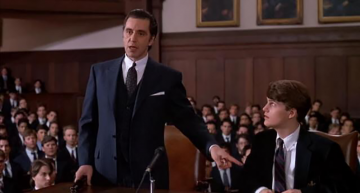 You would do better to copy the style and mannerisms of Al Pacino because of the way he uses his voice, presence, charm, and facial expressions. Concentrate more on the way you use your voice and your presence on the stage rather than trying to create an epic speech in search of rapturous applause. A concise speech means one that gets to the point quickly, hits it hard, and then moves on in the most fluid manner possible. Say it quick and do not waste all the goodwill you have before you. The worst thing an audience can do is clap and cheer for you before you start your speech because after that your popularity and goodwill will only fade. Keep in mind, concise doesn’t always mean short. However, it is synonymous with short because a long speech is synonymous with fluff and waste. So what do you do if you need to give a long and detailed speech? If you have to give a long speech, it is imperative you cut out as much fluff as possible and keep to your point. What you do is break up the process with things such as a rest every twenty minutes. Some of the only people who don’t waste their goodwill while on stage are stand up comedians, so consider adding a little entertainment value as a reward for the listeners’ attention. Consider this article that you’re reading right now. It could have been a very sterile and clinical piece about what is in fact a dull subject. But instead I references movies, TV shows, stand up comedians, and even a console game. And I did it in context to make a point. Concise doesn’t mean short, it means getting to the point efficiently. The longer you stay on stage, the more you burn through the audience’s goodwill. Break up longer speeches with entertainment or a rest every 20 minutes. Entertainment is sometimes as simple as avoiding being boring. A memorable speech may shock people, it may offer surprises, and heavens to Betsy, it may even offend people. However, you must remember: nobody has a right not to be offended. If you say something that offends somebody, you are not restricting the rights of another person. By keeping silent and not making your point through fear—they are the ones impeaching and restricting you! Some speechmakers offend because of their jokes, which is unfortunate but sometimes unavoidable. Others offend on purpose in order to make their speech memorable, and this too is not the way to go. The most pure form of offense is to tell the truth. Watch Chris Rock’s “Bring The Pain” stand up routine, and you will find it memorable because he says some of the most jaw dropping things and yet they all ring true. What he says is deeply offensive to some people, but it must be memorable because people still talk about it. People are tired of phonies making speeches. That is why the authentic speech Matt Damon gave in the Adjustment Bureau was so good, and why the newsroom rant by Jeff Daniels was so powerful. Cowards write the worst speeches. Do not cause offense on purpose. The truth often offends, but it makes for a more memorable speech. Phony is regular, and phony is boring. Republicans are great at asking rhetorical questions when they are speaking, and it really works well because it forces your listener/watcher to think. Nip a few answers into your speech so that your audience doesn’t have to think too hard otherwise they will start to lose the thread of what you are saying. Hypothetical questions are ideal for changing people’s minds. Put the audience in somebody else’s shoes, and see how they like it. Allow your listener a little time to think if you wish, or simply run straight to the answer. A common trick used by liberals is to ask a hypothetical question and then assume the listener came up with the same answer you did. There is a Bernie Mac joke that discusses hypothetical questions where he also has the audience figure out the punch line of the joke before he finishes it. As a word of warning for those that are unfamiliar with Bernie Mac, his jokes are a little blue. Consider yourself warned. Use hypothetical questions to put people in other people’s shoes. Rhetorical questions are ideal for forcing your listeners to think rather than simply listen. Liberal leaders Bill Clinton and UK Liberal Prime Minister Tony Blair are experts at giving speeches and conducting themselves in public. And both have wildly different approaches. 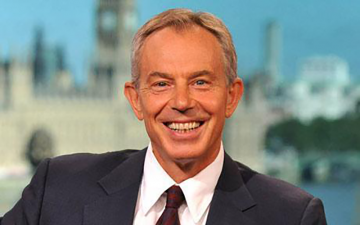 Tony has a permanent smile as if he has everything arrogantly under control. And he punctuates his words with his hands. He also speaks slower when saying important things. Bill on the other hand carries himself with great charm and focus so that you feel as if he was talking directly to you. Notice that when he was giving his famous speech denying his affair, he took after Tony Blair by speaking slowly and punctuating each of his words with his hands. Copying the techniques and styles of other people is cheap and often fruitless, but you can add bits of their style to your own as you are developing your speaking and writing style. Be like a poker in the flame. When it comes out red and hot it is not on fire, but it has absorbed some of the heat. You may be better off picking a speech giver that is already similar in style and technique to your own. Alternatively, pick a famous speech giver that is suitable for your target audience. Do not copy the styles of other people, but use elements of their style as your own. Watch the masters and figure out what they are doing that makes their speeches so powerful and their techniques so effective. A sound bite is a single message that is the point of your entire speech. It is something small and simple people can take away with them. It helps them remember the content of your speech the next time they hear the sound bite. You hear many of them near and around elections. For example, Donald Trump’s sound bite is “Make America Great Again,” and it has a lot of power behind it. Remember you want people to talk about your speech at least a week after you have given it, so give them a happy parcel of information they can carry with them. TV adverts use them all the time and repeat them at every opportunity because it makes them memorable. A sound bite and/or tagline helps make your speech more memorable. 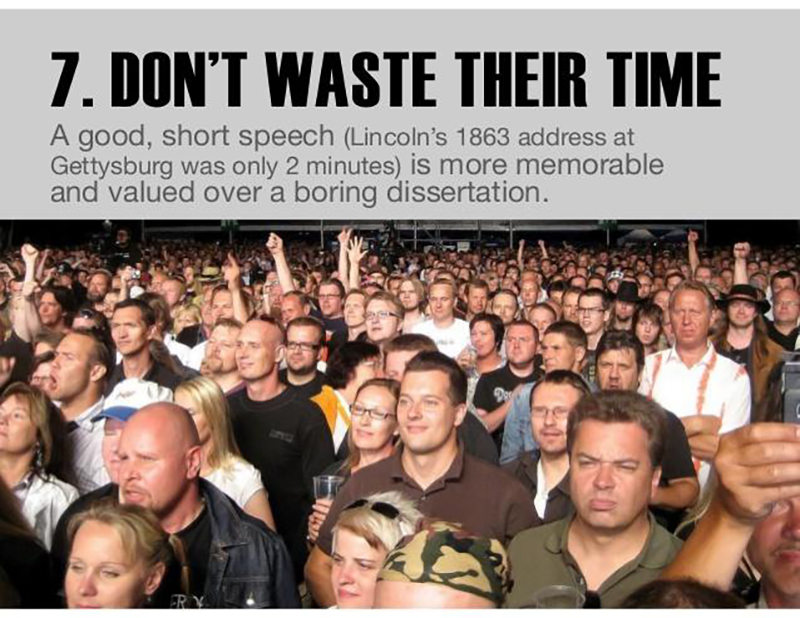 Ideally, your speech should be memorable enough for people to talk about it in a week and still remember some of it. Overuse your tagline and it will annoy your target audience. Remember the three elements of a successful speech. It must be understood, memorable, and engaging. If you keep these three things in mind while implementing some of the tips here, you stand a better chance at pulling off what you want to accomplish. Your turn. Any thoughts on the points made here? Have you written a speech and have any tips to share? Leave them in the comments below. Laura – excellent examples of do and don’t do for speech making. Many of the points are good to work into regular conversations as well. For those who aren’t comfortable with humor (like me), telling a story and smiling appropriately work well. A big factor I learned in Toastmasters was to trust your memory and expertise to carry you through. Memorizing isn’t a good remedy. Preparation includes thinking of other possibilities you might bring up. The interest level of the audience sometimes makes me change focus and direction. Having alternatives in mind helps. Thank you so much for your feedback, Virginia! I like what you say about not memorizing a speech. It doesn’t tend to work as well unless you are a professional actor. I used to keep bullet point notes for important points, so that if I lost track, I would glance down to remind myself of the next bit. This can be a risky thing to do, but that is where practice comes in. It gets to the point where a speaker is able to improvise a great speech. On the other hand, there may be more to it than that. Napoleon Hill said that if a person is passionate about something, they do not need notes because they speak from the heart. It sounds wishy-washy, but I think he had a point. The best advice I ever had on making a speech was that it should be short enough to be interesting and long enough to cover the subject. I think that principle applies equally well to content marketing and webinars. Neal, thanks for your feedback! I know what you mean about content marketing and webinars, but the problem with webinars and seminars is that part of the process involves marketing. People need to feel they are getting value for money. For example, if someone attended a seminar on advanced marketing and the speaker spent just half hour talking about basic SEO, the attendee would feel ripped off. Even if the seminar presented simple solutions to simple problems the attendees would feel ripped off. Sadly, sometimes keeping it short and concise is not an option. Neale, thanks for your feedback! Keri, thank you so much for your feedback. It used to bother me when people said I should learn by copying others. It used to bother me because copying is always a short cut to a sub-standard product. However, what I discovered is that when you copy other people, you can pay attention and discover “why” something works. I started with jokes. I didn’t understand why certain jokes seemed to get a laugh every time, and why some jokes needed emphasis or acting. Watch other people, and you may be able to figure out why something works. Watch the movie Wayne’s World. The comedy is ALL derived from character, acting and charm. If you were to read the script, you wouldn’t find a single funny line or element, but watch the movie and it is somehow funny. This is an excellent piece with such memorable examples of powerful speeches .Your ideas are concise and clear and will keep one’s audience glued to what you are saying (not BORING! Helpful-YES!) I definitely agree with creating an emotional tie with one’s audience. This is so well written, that I would love to steer my blog traffic to your article at http://www.twocandobooks.wordpress.com I know it would be beneficial to anyone associated with public speaking. Thank you for your feedback! You can drop an email me – laura.jonson13@gmail.com to discuss opportunities of possible collaboration. Did you seriously include references to stand-up, film, and video games all in the same post? I love it! It kept my attention and its like you wrote it for me, especially as i work on my speaking skills. GTE stuff Laura! Rocky, thank you so much for your feedback! I often get in trouble for adding in references to movies, stand up and games. Usually, it is when the editor doesn’t understand the reference, or feels it is a little too tongue-in-cheek. My argument is that part of the information dissemination process is keeping people’s attention. Crude marketers think this means bright lights and noise, but it is mostly about having your own voice. Plus, you can’t rule out the power of people’s history when conveying a message. To say, “A couple were arguing” is accurate, but doesn’t paint a picture. If you say, “When they argued, it was like the first 20-minutes of Saving Private Ryan,” it makes a far bigger impact.